Introducing the latest version of award winning Deep-Sky Planner. Deep-Sky Planner 7 is here! Version 7 brings the most up-to-date professional catalog data to you and lots of new features. Deep-Sky Planner 7 makes your imaging and visual observing faster, easier and more accurate. You can watch the introduction video below, or you can read a list of features that are new in version 7 further below. There is also more information on the Product Info page. Upgrade Now! Upgrade pricing is available for owners of version 6 (see upgrade policy). See the Knightware Store for purchasing information. Catalog data have been expanded and updated. There are now over 1.55 million objects in the database and over 1 million cross references to these objects. SAO star catalog has been added to the database. A complete cross reference between the SAO and Hipparcos catalogs has also been added. Brightest emission line data have been added to the database for planetary nebulae. This is useful for determining the best optical filter to use for visual observing and narrowband imaging. The following catalogs have been updated: GCVS, NSV, WDS, PGC, NGC and IC catalogs. The NGC/IC catalogs are taken from the latest Revised NGC/IC from Dr. Wolfgang Steinicke. This is probably the most updated and corrected edition of the NGC/IC available today. Many corrections have been made to the database. Orbital elements for visual binaries have been updated so that highly accurate ephemeris information (PA and Separation) can be calculated for any instant for well-studied double stars. Chart cross references have been added for Interstellarum Deep Sky Atlas (Oculum-Verlag/Cambridge University Press). Visibility Modeling has been added to reports. This is a major new feature that requires input of new metrics for instruments, observers and sky conditions. The user interface allows these metrics to be entered in a simple, efficient way. A new Push To function has been added. Push To transmits the coordinates of any object selected in a report to Sky Commander or Argo Navis, thus allowing you to use the object locating feature of either device to find any object in a Deep-Sky Planner report. This feature makes the number of objects known to your device limitless. Brightest emission line data can be added to observing plan documents for nebulous objects. These data have also been added to the database for planetary nebulae so that they are available when building an observing plan from a deep-sky report or another observing plan. Emission line data is useful for determining the best optical filter to use for visual observing and narrowband imaging. Observing Plan reports can now be exported to ACP Observatory Control software. You must have Maxim DL 5.24 or later and ACP 8 or later to import these files. The ordering of objects is maintained in the export file so you can use Deep-Sky Planner's filtering and sorting capability to control the list. Exposure information is specified during plan export. Observing Plan reports can now be exported to Astro Photography Tool software. You must have APT 3.3.0 or later to import these files. The ordering of objects is maintained in the export file so you can use Deep-Sky Planner's filtering and sorting capability to control the list. Observing Plan reports can now be exported to Sequence Generator Pro software. You must have SGPro 2.5.1.3 or later to import these files. The ordering of objects is maintained in the export file so you can use Deep-Sky Planner's filtering and sorting capability to control the list. Observing Plan documents can now be exported to Cartes du Ciel format. These files can be imported using the Observing List function in Cartes du Ciel 3.1 or later. You can lookup data for an object in the SIMBAD astronomical database and transfer the information directly into the Observing Plan Object Editor. 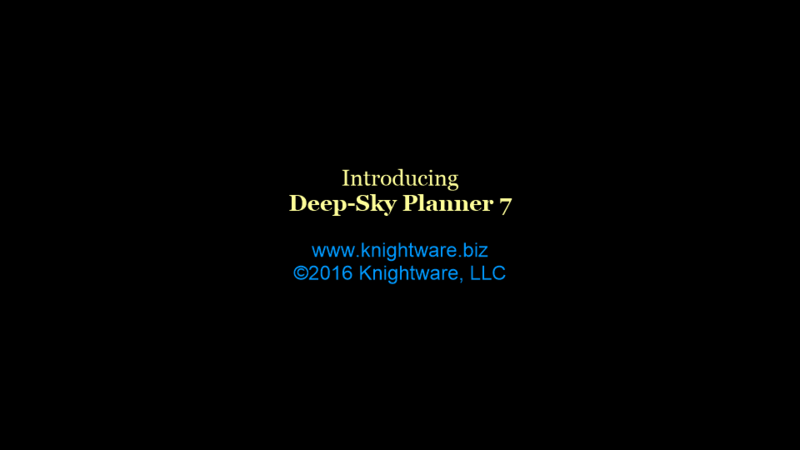 Deep-Sky Planner 7 is backward compatible with version 6 documents. That is, all document types created by Deep-Sky Planner version 6.x can be read by version 7. Documents opened and saved by Deep-Sky Planner 7 are not compatible with version 6. Observing Log information can be moved from version 6 database into version 7 database by using Backup / Restore or Observation Manager Export and Import. Sky darkness, transparency and seeing conditions may be shown on the Equipment/Conditions Bar. These can be entered any time. Darkness data can also be read continuously from a Sky Quality Meter. Weather conditions (temperature, humidity and dew point) may be shown on the Equuipment/Conditions Bar. These can be entered any time, or they can be read continuously from an ASCOM supported weather device or service. You may specify a display format for Altitude and Azimuth values in reports. Cardinal directions are shown on the Daily Altitude graph of objects in the detail pane of reports. The designation matching engine now prefers to return double star names from the WDS above CCDM. Please see Designation Lookup Engine. This change was made because data for double star pairs are often more useful than data for a double star component. Cross references for the interstellarum Deep Sky Atlas (Oculum-Verlag) have been added to reports, and corresponding search filters have been added to search documents. Planet Events reports can now be exported to iCalendar file format. These files can be imported into most calendar applications and services like Apple Calendar, Google Calendar and Microsoft Outlook. The Deep-Sky Planner installer can copy its interoperation plug-in for Starry Night Pro and Pro Plus (versions 6 & 7) if Starry Night is installed in its default location. The plug-in can also be copied to Starry Night installations manually. License activation can now be done online or by email.